The way these growers set up their electrical alerted the Public Utilities company to unusual activity, and they notified the police. The police said it looked like a harvest had recently just happened but the evidence had been transported somewhere else. So in addition to the 950 plants found being grown by Denny Kusnadi, 44, and Susanna Laij, 39, officers speculate that even more recently harvested and processed marijuana had been taken to another location. Manteca Police spokeperson Sgt. Jodie Estarziau said at the time of the warrant service the suspects were found to be transporting about 30 pounds of marijuana in their vehicle. 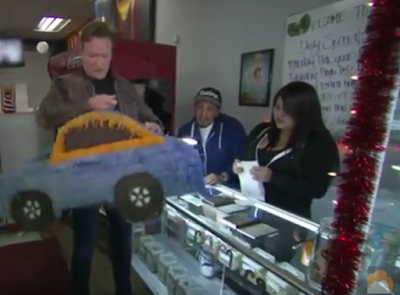 This is probably more weed than Conan O'Brien would ever carry in his car, even if it was in a piñata. She (Sgt. Jodie Estarziau) noted that marijuana was found in all stages of production including growing, drying, in process and finished processed product. The seized marijuana weighed just over 280 pounds and evidence of sales was also located, she added. For more information on this case please take a look at the article over on The Manteca Bulletin.